Week 6 (and a half)…’Details’! Last weekend we celebrated my in-laws 50th Wedding Anniversary. This was the cake my youngest sister-in-law had her mother-in-law bake for the celebration. I just loved the simple ‘details’. Covered in red roses, sprinkled with gold dust, sitting on a gold plate, and inside, a surprise Oreo filling for John’s Dad! 😉 But, my favorite part was the bride and groom sitting on the top. 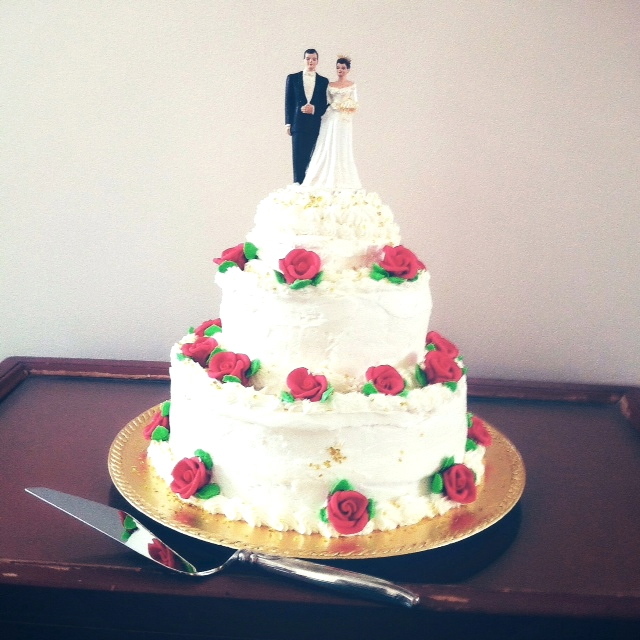 This was the same topper that stood on their original wedding cake fifty years earlier and also used on my youngest sister-in-laws wedding cake. How neat is THAT? It was the perfect detail for this golden anniversary! I shot this picture with my iphone in really bad lighting, which caused the photo to be a bit blurred. I decided to crop, center focus and sharpen in snapseed and then I applied a filter in afterglow. In the end, I was ok with the finished product and the nostalgic look it holds. I turned 43 yesterday so this makes the beautifully detailed hand knitted jacket and dress set that you see above just about that many years old. 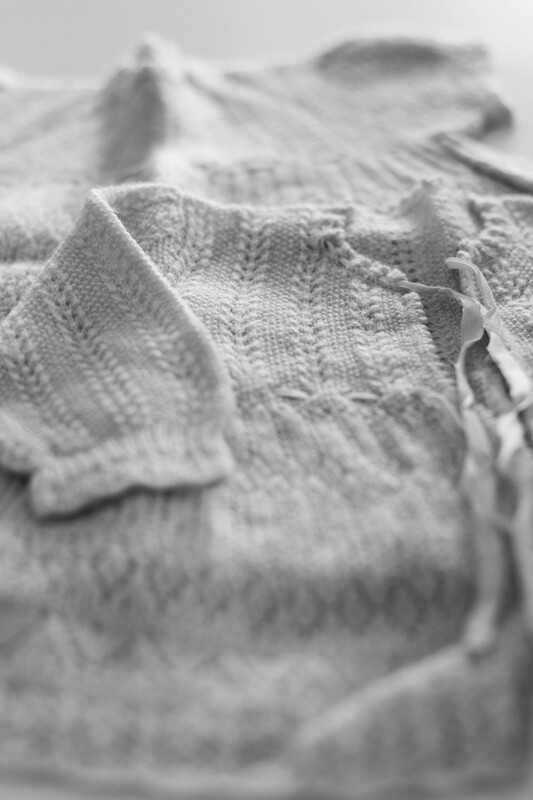 It was lovingly made by my grandmother for me – baby Alexandra – and is a miracle of tiny stitches and aged fragile ribbon that still maintains a delicate cream hue, although I did convert this image to black and white to emphasize it’s timeless quality. I used a shallow depth of field so that I could highlight the intricacy and pattern of the knit by focusing on one point in the picture. I only wish I had a fraction of the talent that she had, and I’m still in awe that it remains perfect, so many years later. I used my Canon DSLR paired with a 50mm 1.4 lens for this photograph, which was taken at around 10 o’clock in the morning when the light was beautiful in my bedroom. My ISO was 320, shutter speed 1/60, and aperture set at f/2.2 to achieve a shallow depth of field. Post processing in Lightroom 4, I converted the picture to black and white, and then decreased the temperature and increased the tint. I also adjusted the clarity and contrast of the image. That is amazing Alex! Although I love how it’s blurred at the bottom for artistic effect, as a knitter I wish it wasn’t so I could see all the detail. You’ll have to show it to me.